This allegory was created on the occasion of the World Exposition 1900 in Paris. 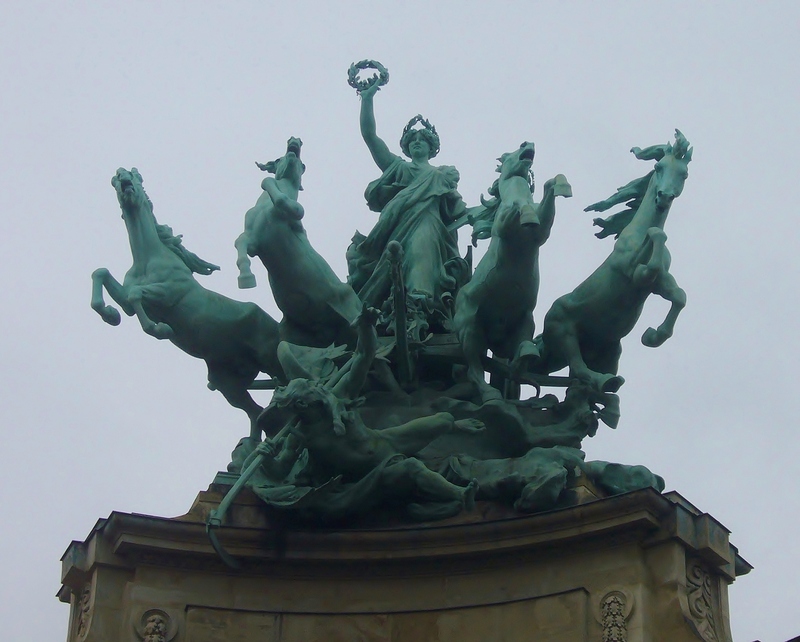 ‘Immortality’ is a female quadriga driver. She holds a laurel wreath in one hand and the book of memory in the other, both to reward the creative genius. The team of four horses jumps over an old man with a scythe who represents ‘Time’. In this way the victory of creative performance over temporary life is given shape. It is striking that the horses do not trample on the old man on the ground, but just jump over him, as horses naturally would do. The artist has made an impressive sculpture in which the four horses play the dominant role, although the victorious ‘Immortality’ is the leading figure. Many people will have passed along the Grand Palais in Paris without seeing this sculpture and its counterpart ‘Harmony overrules Discord’. The high position makes it difficult to view them. All the more a reason to choose this work to start the new year 2016.